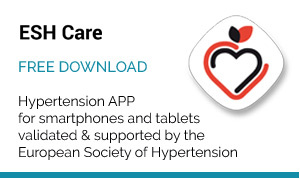 A new analysis from the BEAUTY (Better control of BP in hypertensive patients monitored using the HOTMAN system) study revealed that impedance-guided therapy did not improve central blood pressure or pulse wave velocity compared with the control group. 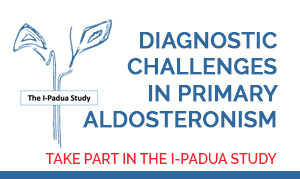 Pierre Boutouyrie, MD, PhD, INSERM, Université Paris Descartes, Paris, France, presented the results. 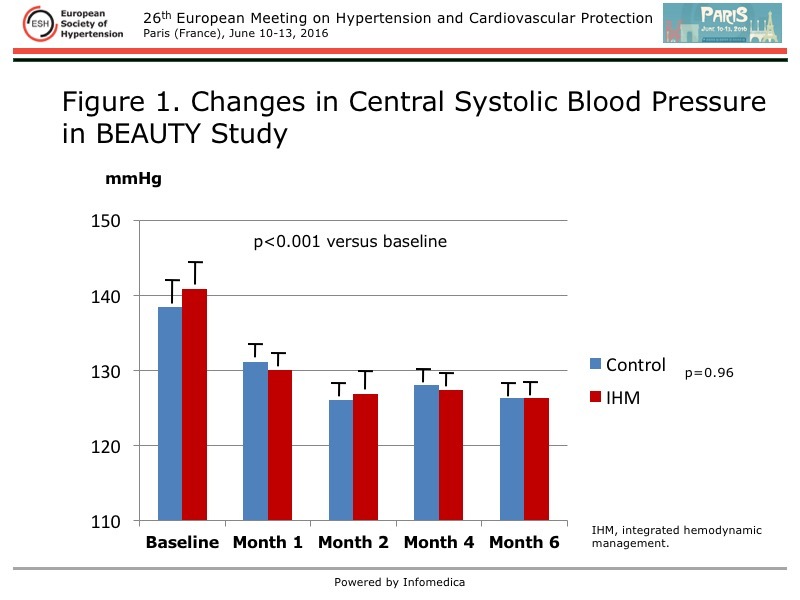 The main results of the multicenter BEAUTY study showed blood pressure control was similar in the two groups at 6 months, despite better improvement in overall hemodynamic status with the integrated hemodynamic management (IHM) than with usual guideline-directed management (49% vs 27%) [Fadl Elmula FE et al. J Hypertens 2015]. 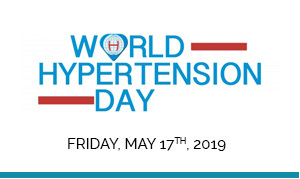 Slightly better control was observed for home systolic blood pressure (SBP) with IHM, but otherwise control was similar for other measures of SBP (day, night, 24-hour, office). In both groups, there was an increase in the number of antihypertensive medications, from 3.1 to 4.1, and slightly more diuretic use in the IHM group. There were fewer side effects in the IHM group. 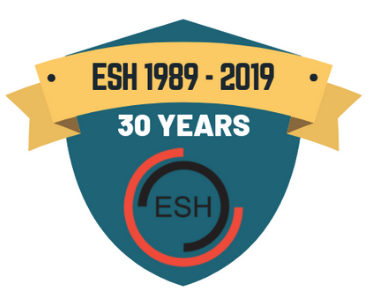 The prospective, randomized, open-label, blinded endpoint BEAUTY study included 250 patients with essential hypertension that was not controlled with two to four antihypertensive medications. Evaluations at baseline and 6 months were ambulatory blood pressure monitoring (ABPM), echocardiography, and pulse wave velocity. In this analysis, the investigators examined changes in arterial stiffness and central blood pressure in the BEAUTY trial to determine whether they were improved by a drug selection algorithm driven by data from noninvasive hemodynamic profiles. Applanation tonometry using the Sphygmocor system was used to measure pulse wave velocity and central blood pressure. Of the 167 patients in the BEAUTY study, 115 were included in this analysis. They were aged 64 years, were taking a median 3 antihypertensive medications, and had an average SBP on ABPM of 143 mmHg. A marked and significant reduction in central SBP was found at 6 months in each group, but there was no difference between the groups (Figure 1). 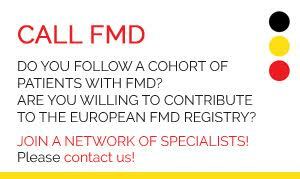 An improvement was seen at the first monthly visit and maintained thereafter. A similar pattern was seen for central pulse pressure. The augmentation index had slightly higher values with IHM at each monthly evaluation, but the between-group difference was not significant. There was no interaction between IHM and and improvement in the augmentation index. Amplification, a measure of peripheral-central SBP, also was not different between the treatment groups. 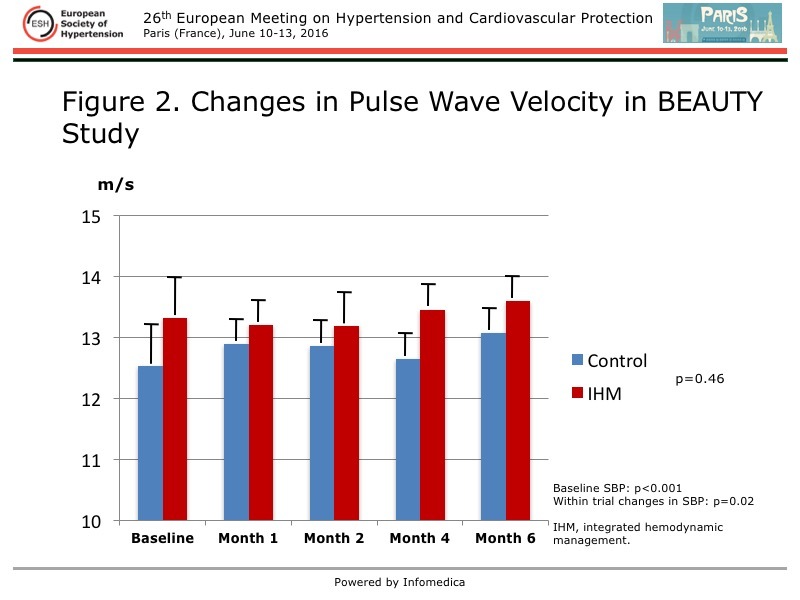 Pulse wave velocity was significantly improved from baseline to 6 months with IHM (p<0.001), compared with control, with improvement at each monthly assessment (Figure 2). However, after adjustment for within trial changes in SBP, there was no significant difference between the groups. The data were consistent, with a significant correlation between pulse wave velocity and SBP in both groups at each visit, indicating no differential effect in either study group. 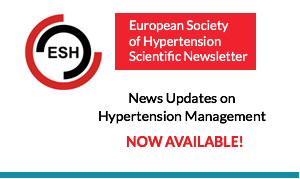 Although essential hypertension is linked to multiple systems, including sodium retention, and vasoconstriction and high cardiac output through the sympathetic nervous system and activation of the renin angiotensin system, the capacity to monitor related hemodynamic changes in a noninvasive manner has not translated into improved blood pressure control in the BEAUTY study. Further, this analysis has shown that monitoring hemodynamic parameters with a predefined algorithm for drug selection did not result in any difference in central blood pressure or pulse wave velocity between treatment approaches. 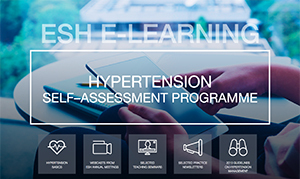 Similar improvements were observed for central blood pressure, wave reflections, and amplification during the study, and changes in pulse wave velocity were parallel to improvements in blood pressure with each treatment approach.